Deep plum in colour with vivid red hues. Fragrant cassis and dark plum with a cabernet leafy note. The dark fruits are complexed with chocolate, tobacco and cedar notes. Rich red and black fruits fill the mouth. Raspberry, red currant and plum fruits are balanced with fine sandy tannins and cedar oak. 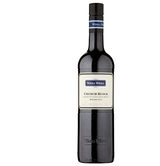 This medium to full bodied wine shows a lovely balance and style in true Church Block character. Firm and juicy, featuring black cherry and licorice flavors set on a medium body, with firming tannins, floral accents and cedar and white pepper hints that linger on the finish. Cabernet Sauvignon, Shiraz and Merlot. Drink now through 2028. 500 cases imported.